This week is the 12th annual Air Quality Awareness Week, and the theme is “Air Quality Where You Are.” DEP and the state of New Jersey have made it a priority to improve air quality and increase air quality awareness. 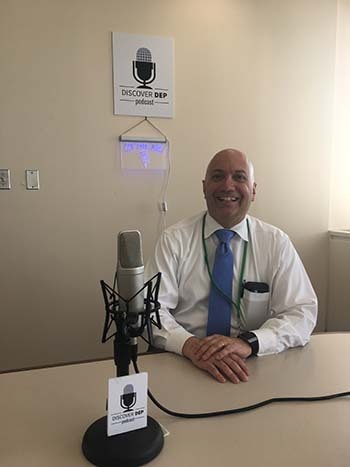 To help celebrate, Frank Steitz sat down with Gladys Giron to talk about air quality, criteria air pollutants, how well New Jersey is meeting federal standards, how to reduce exposure to ozone, and this week’s initiatives both in New Jersey and around the nation. 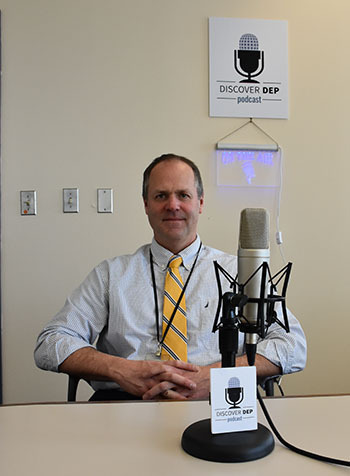 Listen to Discover DEP’s Air Quality Awareness Week podcasts from 2016 and 2017. Trenton was the third city to join DEP’s Community Collaborative Initiative. 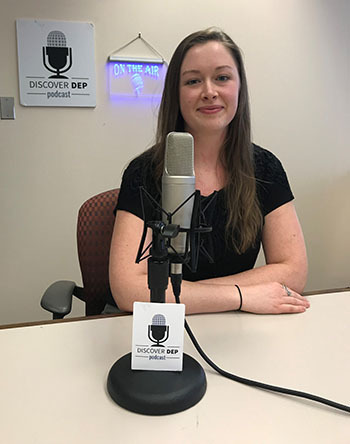 In this episode, Bob Bostock sits down with Julie Krause, single point of contact for Trenton at DEP, to talk about her work with local government officials, community groups and stakeholders to support environmental improvement projects important to the city. 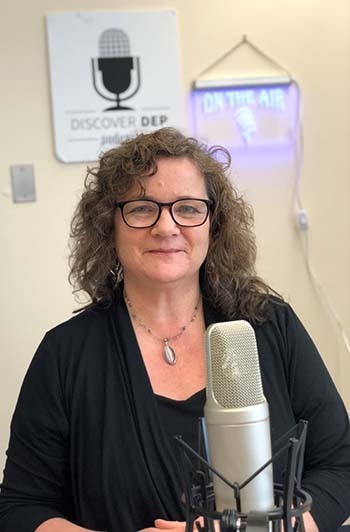 Listen in as she talks about current projects, such as the Assunpink Daylighting, as well as the collaboration necessary to make these projects successful. Listen to Frank McLaughlin’s episode on the Camden Collaborative Initiative here. Listen to Bill Lindner’s episode on Perth Amboy here. To learn more about CCI in Trenton, click here. Since the first National Women’s History Month in March 1987, every year we take a moment to recognize, honor and celebrate the achievements of American women. This month recognizes the courage and contributions of women everywhere who are breaking down barriers, raising their voices and fighting for what they believe in. There has been a continuous effort to bring and engage women in the STEM and environmental fields – including here at DEP. Women are represented in every leadership category at DEP – from the executive team, assistant commissioners, directors and administrators. Gladys Giron sits down with Deputy Commissioner Debbie Mans to talk about her experience so far at DEP as well as some of her past barriers and accomplishments. New Jersey’s state parks are home to about 1,000 miles of official trails and, thanks to the State Park Service, every mile is now available on Trail Tracker. Trail Tracker allows you to track your current location, view trails and points of interest, search for park activities, and download PDF maps of New Jersey’s state parks. This app is helpful in planning for trips to state parks and can also be used in real-time to track your location in any of our state parks, forests or recreation areas. 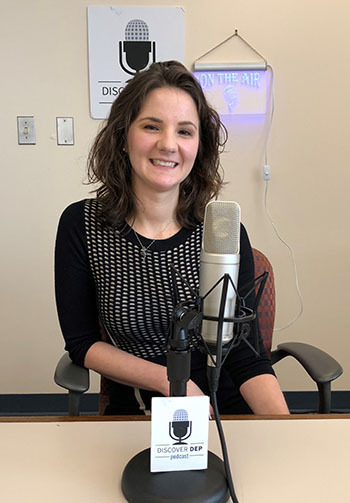 Listen as Heather Merring, one of Trail Tracker’s creators, sits down with Gladys Giron to discuss how this app got its start and the resources it offers. This week (March 11-17) is AmeriCorps Week, which celebrates AmeriCorps members and alumni for their commitment to educating the public about the environment, stewardship, and the impact their work has around the state and nation. In fact, DEP’s own AmeriCorps New Jersey Watershed Ambassadors are celebrating throughout the state. 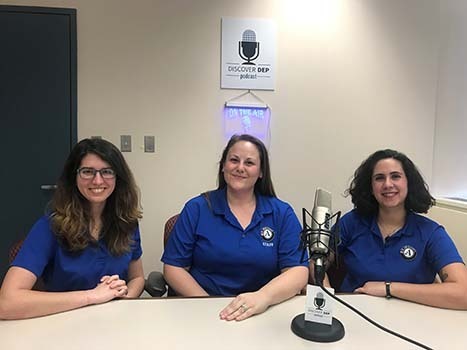 In this week’s Discover DEP episode, Gladys Giron talks about AmeriCorps Week with Amanda Lotto, current AmeriCorps NJ Watershed Ambassador Program Manager and former Watershed Ambassador, Lauren Cromie, Ambassador for the Mullica River Watershed, and Isabella Castiglioni, Ambassador for the Rancocas Creek Watershed. With spectacular views of New Jersey, Pennsylvania and New York, as well as many superb trails, High Point State Park is one you shouldn’t miss. As its name suggests, High Point is nearly at the northern-most point of our state. It is also home to the highest point of elevation in the state. 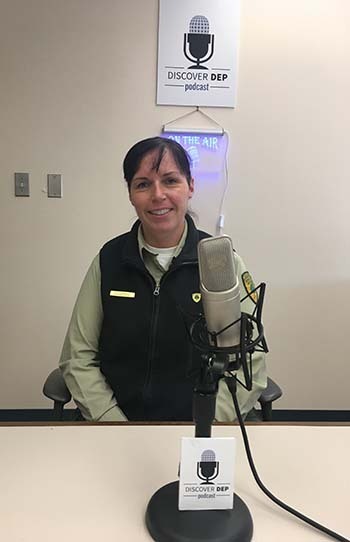 Listen in as Gladys Giron talks with Rebecca Fitzgerald, Superintendent of High Point State Park, about this park’s unique amenities, opportunities, programs and natural areas. Last year, the lobby in DEP’s main building in Trenton featured a display highlighting the connection between baseball and New Jersey’s geology. 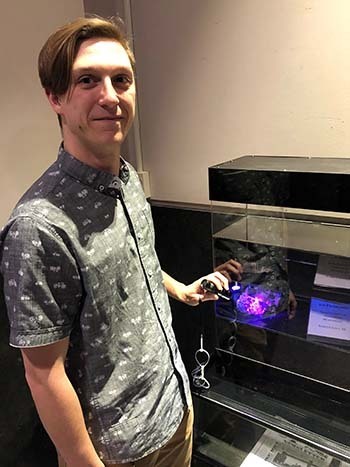 Now, this latest display features a new aspect of New Jersey’s geology – fluorescent minerals. Under ultraviolet light, certain minerals glow with an amazing array of vibrant colors. This is known as fluorescence. 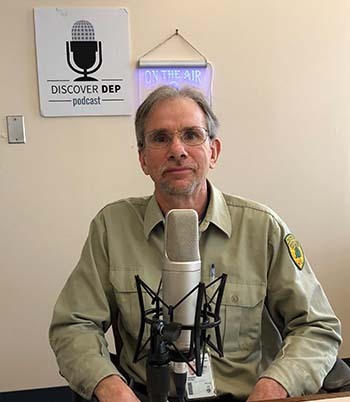 Bob Bostock sits down with Chris Adair, part time assistant geologist in DEP’s Division of Water Supply & Geoscience, to discuss this new display and these intriguing rocks. Learn about Sterling Hill Mining Museum here. Learn about Franklin Mineral Museum here. Resource Interpretive Specialists tell the story of New Jersey’s history, nature and our world, helping people connect to their environment through public programs, hikes, exhibits, recreation, ecotourism and education. 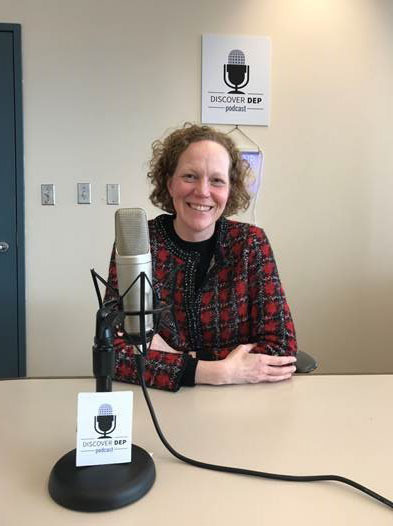 Bob Bostock sits down with Diane Hewlett-Lowrie, a Resource Interpretive Specialist for New Jersey’s State Park Service, to discuss her experiences as a naturalist at DEP and programs she has spearheaded. Visit http://www.state.nj.us/dep/parksandforests/parks/parkindex.html to learn about New Jersey’s state parks, forests, recreation areas and marinas. Visit www.spstrailtracker.nj.gov to use the Trail Tracker web app, and stay tuned for an upcoming podcast about it. Visit http://www.nj.gov/dep/docs/monarch-guide.pdf to view DEP’s Monarch Butterfly Conservation Guide. Maple sugaring is a tradition in the Northeast that began centuries ago with Native Americans and colonists. 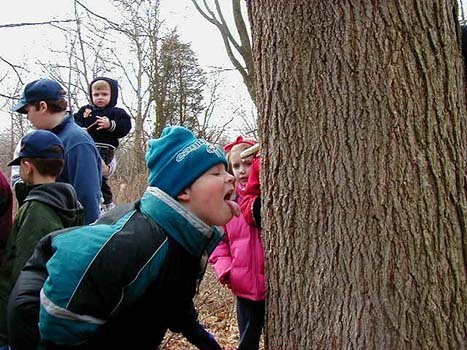 Now, organizations around the country have maple sugaring programs to bring this tradition to life for people of all ages to see and enjoy. Wayne Henderek, Resource Interpretive Specialist at the Washington Crossing State Park Nature Center, sits down with Bob Bostock to discuss the processes of sap collecting and syrup making, as well as the maple sugaring program at Washington Crossing State Park, a participatory demonstration of the procedures of home maple sugar production.